Welcome to Mississippi. Here, the character of the Old South can still be felt with the scents of the magnolia blossom floating on the warm, moist breeze. Stately antebellum mansions are preserved across the state, hosted by women in billowing hoop skirts during the spring and summer months. 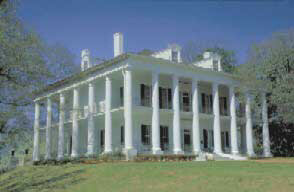 Mississippi is a state that is proud of its history and works hard to preserve the memory of the Old South. When Mississippi was a one-crop state before the arrival of the boll weevil in 1907, plantations thrived, and cotton was king in the fertile soil of the Yazoo-Mississippi delta. Today, though Mississippi ranks among the leading producers, cotton competes with other crops, like soybeans, and manufacturing has replaced agriculture as the economic leader. Mississippi is the nation's largest producer of upholstered furniture. Mississippi has not experienced the urban growth of other states and is still very much a land of small towns scattered among rolling farmlands and forested hills. About 40% of of Mississippi is occupied by about 42,000 farms. 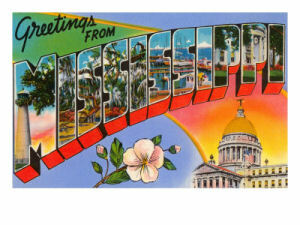 The state of Mississippi is named after the Mississippi River. Though the river was called by many different names, the name Mississippi given to it by the Indians was the name that was used on Robert Cavelier Sieur de La Salle's map of the area in 1695. Mississippi means "large river" to the Chippewa Indians. The most well-known nickname for Mississippi is "The Magnolia State." This nickname honors the stately beauty of the Magnolia Trees of Mississippi. The Magnolia is Mississippi's official State Tree and the blossom is Mississippi's official State Flower. "The Magnolia State" appears on the Mississippi 50 States commemorative quarter issued in October of 2002. Mississippi is sometimes referred to as "The Bayou State" for its slow-moving streams that wander through marshes and lowlands along the Mississippi River and the southern section of the state to the Gulf coast. This name came from the Mississippi Coat of Arms which depicts a Bald Eagle clasping arrows and an olive branch in its talons. The Mississippi Coat of Arms, based on the National Coat of Arms, can be seen on the Mississippi Great Seal. This nickname is attributed to the Mississippi Coat of Arms as well though it is not known why the "Border-eagle" is specified. Large catfish wandering the swamps and rivers of the states were referred to as Mud-cats. This humorous name references these large fish. In John Goff's 1892 Book of Nicknames , Mississippi is referred to as "The Mud-waddler" state. No explanation is given. It is assumed that this name originated at some point due to the population of ground hogs in Mississippi. Though referred to in John Goff's 1892 Book of Nicknames , this name, like "The Mud-waddler State," is not explained. People who live in Mississippi or who come from Mississippi are called Mississippians. The Mississippi State Quarter is the 20th quarter released in the U.S. Mint's 50 State Quarters Program and the fifth, and last, to be released in 2002. This stately design is one of our favorites. The strongly directed message depicts beautiful magnolia blossoms, and all that they represent, along with a Mississippi state nickname, the Magnolia State. If you've never been fortunate enough to languish in the scent of the magnolia blossom, make a point to correct this. 1817 is the date that Mississippi was admitted to the union. Mississippi (From Sea to Shining Sea) , by Barbara A. Somervill. 80 pages. Publisher: Children's Press(CT) (September 2003) Reading level: Grades 3-5. Presents information about Mississippi's people, geography, history, landmarks, natural resources, government, state capitol, towns and cities, and more. 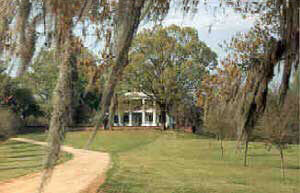 Mississippi (World Almanac Library of the States) , by Acton Fiqueroa. 48 pages. Gareth Stevens Publishing (January 1, 2002) Reading level: Grades 4-6. Filled with the most up-to-date information, including the latest Census results. Full-color photos bring to life the story of Mississippi. In addition to an in-depth factual profile of Mississippi in the form of a state Almanac, this book offers fascinating and lively discussions of the state's history, people, geography, government, economy, culture, and lifestyles. A section on Notable People, a calendar of events, and enough primary source documents, time lines, maps, and other tools to make this unquestionably the best young adult reference material on the USA available anywhere. Mississippi: A History , by Wesley S. Busbee, Jr.. 445 pages. Publisher: Harlan Davidson (January 30, 2005) In his sweeping coverage of the Mississippi story--from prehistoric times to the present day-- Professor Busbee deftly combines narrative and topical chapters to address major political, economic, social, and cultural developments. Having taught Mississippi history in college classes for more than thirty years, Dr. Busbee approaches this unflinching account by asking why Mississippi--with its rich natural and human resources--continues to compare unfavorably with other states in such critical areas as per capita income, adult literacy, and public health. "How and why," he asks, "did all of us who call Mississippi home get where we are? What past mistakes might we hope to correct and what innovative approaches might we take to enhance the future of the state?" The book seeks answers to these meaningful questions through a careful assimilation of information gleaned from a multitude of secondary and primary sources. It also includes original maps and tables as well as a multitude of photographs, selected sources by chapter, a Selected Bibliography of Mississippi History, a series of appendices, and a full subject index. Mississippi (On the Road Histories) , by Ben Wynne. 178 pages. Publisher: Interlink Books (November 30, 2007) Beginning with the state's earliest settlers, Ben Wynne explores the paradox that is Mississippi-its rich soil and namesake river, yet its vulnerability to natural disasters such as Hurricane Katrina. It is one of the US's poorest states, yet has one of the richest cultural legacies. It is the birthplace of the blues and the childhood home of such American icons as Elvis Presley, William Faulkner, Oprah Winfrey, and B.B. King. Wynne sketches Mississippi's development from primarily native settlements and wilderness to industry-driven cities; examines the importance of slavery and agriculture and the resulting devastation that followed the Civil War; and follows the slow transition from segregation to equal rights marked by the Civil Rights movement of the 1960s.